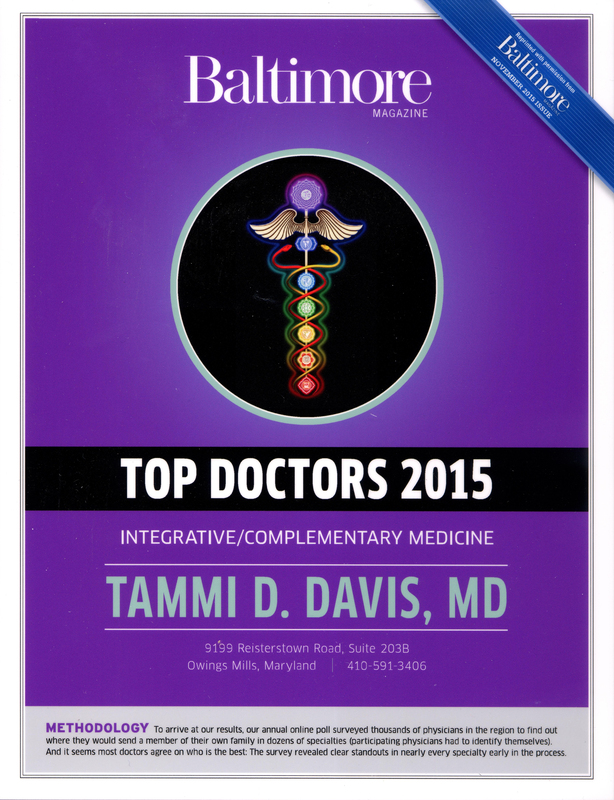 Dr. Tammi D. Davis, a Family Physician and Medical Acupuncturist in the Baltimore area, recognized as Baltimore’s Top Doctor for Integrative/Complementary Medicine by Baltimore Magazine, treats a wide variety of medical and emotional conditions. Dr. Davis, a Board Certified Family Physician trained in traditional medicine, has found that traditional medications and treatments can sometimes fail or have side effects that cause more harm than good. Many patients suffer from chronic conditions such as arthritis, allergy and sinus problems, chronic pain, fatigue, headaches, anxiety, post lyme syndromes, fibromyalgia, insomnia, painful neuropathy, chronic constipation, irritable bowel, headaches, chronic neck and back pain, menstrual problems, etc. that may not fully respond to medications, surgery or physical therapy. There are also many people that cannot tolerate the side effects of medications, or may have contraindications to certain medications. The philosophy of Dr. Davis’ practice is to address all spheres of a person’s health issues including the physical, mental/emotional, and spiritual aspects. When someone has a chronic illness, it almost certainly will affect mood, sleep, appetite, stamina, and relationships. Acupuncture is often useful either as an adjunct or as a primary course of treatment. When a patient seeks acupuncture treatment for a problem, a PHYSICIAN ACUPUNCTURIST has the advantage of being able to do a thorough medical history and exam, making sure that a serious underlying condition is not overlooked. Acupuncture is often used for the following conditions: Acute & Chronic Sinusitis, Dental Pain & Facial Pain, Insomnia, Bowel Problems, Tennis Elbow, Carpal Tunnel, Allergy Problems, Asthma, Vocal Cord Problems, Esophageal Spasm & Gastritis, Neuropathy, Nerve Pain, Fatigue, Anxiety, Depression, Arthritis, Vertigo, Stroke Rehab, Bell’s Palsy, PMS, Infertility, Back and Neck Pain, Sciatica, Headaches, Migraines and Smoking Cessation. 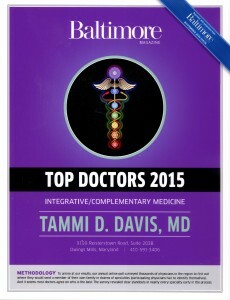 Dr. Davis sees patients for medical acupuncture treatments and integrative medical consultations by appointment only in her Owings Mills, MD office. An extensive medical and acupuncture history is done at the initial visit, as well as an appropriate exam. Dr. Davis allows ample time for appointments and will help coordinate care with patient’s primary care doctor and any specialists involved in their care if needed. Dr. Davis recognizes each patient as unique and she feels that it is important to take time to listen to her patients and to understand their individual concerns. Dr. Davis is accepting new patients at this time for medical acupuncture and/or integrative medicine consultations. The first visit is 2 hours and includes an extensive consultation, history review and review of records/labs. Subsequent visits are 1 hour. The reason for the extended visit time is that in a traditional primary care practice, the patient’s concerns are often not met due to too little time, the provider is often so busy entering data into a computer that they don’t really “see” the person in front of them, there is not enough time face to face with the provider because they are rushed, and trying to leave a message for the doctor is often futile. Dr. Davis answers all phone calls herself. In order to spend plenty of time with each of her patients, Dr. Davis does not accept insurance. Payment is expected at time of service. However, Dr. Davis gives each patient a completed claim form for each visit to submit to their insurance company for possible reimbursement. Medicare does not cover acupuncture. Visits related to Medical Cannabis are not covered by insurance. Dr. Davis is excited to have a new tool to help her patients manage chronic pain, severe nausea, severe pain, PTSD, cachexia/anorexia/wasting syndrome, severe or persistent muscle spasms, and any other condition that is severe and for which other medical treatments have been ineffective if the symptoms reasonably can be expected to be relieved by the medical use of cannabis. In the state of Maryland, patients with these diagnoses may be candidates for medicinal cannabis (medical marijuana). Patients with glaucoma and certain type of seizure disorders may also be treated with Medical Cannabis. Studies show that when narcotic dependent patients use medical cannabis, they often are able to decrease their narcotic dose. Narcotics are associated with constipation, nausea, fatigue, brain fog, and overdoses can be fatal. If you would like to get a certification or you would like to learn more about medicinal cannabis to see if it may help you, please call our office to schedule an appointment. Insurance does not cover any visits relating to Medical Cannabis. Dr. Davis has had great success integrating medical acupuncture, dietary supplements, herbal products, essential oils (topical and aromatherapy), CBD products, medicinal cannabis (medical marijuana), and topical compounded pain creams into her practice. The office is in Owings Mills, a suburb of Baltimore, Maryland. . It is very convenient to Pikesville and Reisterstown. The office is located in Valley Village Professional Center, in the Valley Village Wellness Center, which is at 9199 Reisterstown Road, Suite 203B, Owings Mills, Maryland. From 695 take exit 20 (Garrison/Pikesville) and turn North onto Reisterstown Road (Rt. 140). Go 1.1 miles and turn right onto Craddock Lane. Hours are by appointment only. Please call for office policy, fees, and hours at 410-591-3406. Evening hours are available on Mondays.